The original Locomotor Capabilities Index (LCI) was developed in Canada in 1993 as part of the Prosthetic Profile of the Amputee questionnaire. According to its developers the LCI "computes the global, basic, and advanced locomotor skills of the lower limb amputee with the prosthesis and assesses level of independence". The new LCI version with a 5-point ordinal scale presents similar general psychometric properties to the original LCI, a lower ceiling effect and a larger effect size. The LCI is a disease-specific, self-administered instrument for assessing locomotor abilities generally considered essential for basic and advanced ADLs of people with lower-limb amputation and an enabling factor associated with long-term prosthetic use. It is easily administered and quickly completed. It is composed of 14 questions (phrased as “Would you say that you are able to do the following activities with your prosthesis on?”) about different locomotor activities and selected primarily from the locomotor disabilities classification of the World Health Organization. 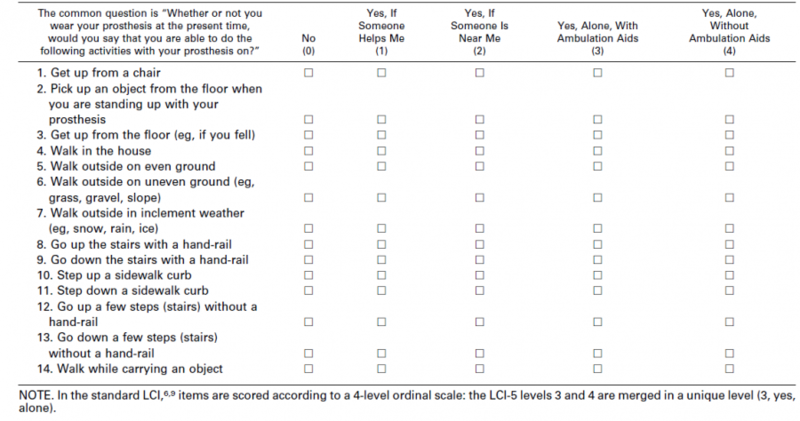 A 4-level ordinal scale (0–3 points; ranging from “not able” to “able to accomplish the activity alone”) scores the degree of a person’s perceived independence in performing each of the 14 activities while wearing the prosthesis.The LCI-5 splits the upper ordinal level of each item, “Yes, able to accomplish the activity alone” into “Yes, . . . alone with ambulation aids” (score: 3 points) and “Yes, . . . alone without ambulation aids” (score: 4 points), with a possible maximum score of 56. The LCI can be divided into two 7-item subscales that cover basic (items 1, 4, 5, 8–11) and advanced (items 2, 3, 6, 7,12–14) activities, respectively. Higher scores reflect greater locomotor capabilities with the prosthesis and less dependence on assistance. The construct validity of LCI and LCI-5 was analyzed by correlation with the Rivermead Mobility Index, a timed walking test, and the FIM instrument. The item-to-total correlations (Spearman) ranged from .50 to .87 (P<.0001 for all). Both the LCI and LCI-5 correlated with all criterion measures (p range, .61–.76), with the LCI-5 showing a larger effect size and a lower ceiling effect. The test-retest reliability, both the LCI and LCI-5 showed a high degree of correspondence and agreement (ICC values) between their total scores, and the Bland-Altman plot confirmed the good reproducibility of both the versions. ↑ Grise MC, Gauthier-Gagnon C, Martineau GG: Prosthetic profile of people with lower extremity amputation: conception and design of a follow-up questionnaire. Arch Phys Med Rehabil 1993, 74:862-870. ↑ Gauthier-Gagnon C, Grise MC: Tools to measure outcome of people with lower limb amputation; Update on the PPA and LCI. J Prosthet Orthot 2006, 18:61-69. ↑ Gauthier-Gagnon C, Grise MC, Potvin D. Enabling factors related to prosthetic use by people with transtibial and transfemoral amputation. Arch Phys Med Rehabil 1999;80:706-13. ↑ Gauthier-Gagnon C, Grise MC, Lepage Y. The Locomotor Capabilities Index: content validity. J Rehabil Outcomes Meas 1998; 2:40-6.